These computer generated animations were real pioneers in the art form-“Toy Story” being the first full length CGI film and spawned an entire new industry in Hollywood with its success. 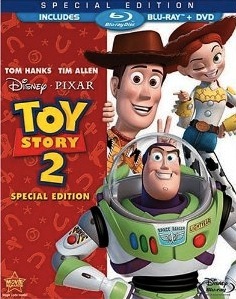 The films have become classics of the genre, with “Toy Story 2” being just as successful as the original. Now the animation seems a bit dated , with the humans far from realistic and the lacking of some details that are part of the genre today with computer advancements. Part of their success was the writing of the stories and the talented voice cast of Tom Hanks, Tim Allen, and other famous celebrities in the toy roles. Joan Cusack makes Jesse the Cowgirl a terrific new character in TS2. John Lasseter, than at Pixar, contributed to the high quality of the production in a number of ways, earning a special Oscar for his work. These Blu-Ray discs (sold separately) come with a DVD copy but curiously do not come with a digital copy, as in other Disney Blu-Ray releases. 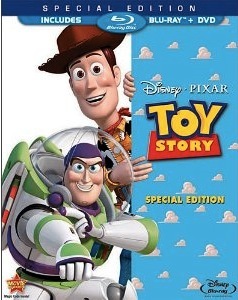 Extras include features on the development of each story, interviews with cast members, Buzz Lightyear Mission Logs, and each release also contains a sneak preview of the upcoming Toy Story 3. If you are a fan of Pixar, celebrate the release of these classics on Blu-Ray.